Nid d'Amour on upouusi ylellinen Gite pariskunnille rauhallisessa ympäristössä, josta on ihastuttavat näkymät Charente-maaseudulle. Tämä viehättävä hotelli aloitti elämänsä Bergerie-rakennuksessa, mutta on rakastettu remontoidusti, jotta se tarjoaisi vanhan ja uuden yhdistelmän - maalaismainen palkit ja paljastetut kivestä - moderniin kylpyhuoneeseen, jossa on porealtaat, poreamme ja tunnelmavalaistus. Majoitus on kaikki samassa tasossa, jossa on viihtyisä oleskelutila, jossa on puupoltin, täysin varustettu keittiö (pesukone, uuni, jääkaappi jne. ), Tyylikkäästi sisustettu makuuhuone ja ylellinen moderni kylpyhuone. Ulkopuolella on yksinäinen yksityinen istuinalue, jossa voit istua ja rentoutua lasillisen viiniä, ja siellä on myös maanpinnan yläpuolella oleva allas, jotta voit viettää kesäisin. Nid d'Amour sijaitsee pienellä Noailles-Hamlet-kadulla, alle viiden minuutin ajomatkan päässä paikallisesta baarista / tabacista ja vain 15 minuutin päässä viehättävästä Confolensin kaupungista, joka sijaitsee Vienne-joelle. On paljon paikkoja vierailla 30 minuutin ajomatkan päässä - upeasta linnoituksesta Verteuilissa, Haute Charenten järviin. Lähin lentokenttä on Limoges, joka on noin 45 minuutin ajomatkan päässä, ja Poitiers, joka on hieman kauempana. Nid d'Amour on ihanteellinen pariskunnille, jotka haluavat päästä eroon kaikista, rauhallisessa ja rennossa ympäristössä. 100 %:n hyvitys, jos peruutus on tehty vähintään 60 päivää ennen saapumispäivää. 50 %:n hyvitys, jos peruutus on tehty vähintään 30 päivää ennen saapumispäivää. The Gite was superbly fitted out and an excellent base for a week exploring the Charente, with a great pool, in which to cool off on the many hot afternoons we experienced. Lisa and Darren were more than helpful hosts and could not have done more to help us relax into the traffic free French way of life in this beautiful region. There are many markets and idyllic villages to explore within 25km and Confolens with its twice weekly market only 12km away, has a couple of excellent restaurants/hotels in which to experience a great lunch de jour as the market draws to a close. A wonderful place to stay. The comfort of the gite is superb, as is every finish within, and the standard of cleanliness is spotless. Great pool for cooling off, bbq for dining and a very well thought out kitchen with everything you need to make it home from home. It is so tranquil we spent many days just taking in the views. We had an amazing two weeks here and now sadly we have to go home, but totally relaxed and rested. We will definitely return, hopefully before the end of the year. Its the best gite we have stayed at. Bless you David and Fiona, it was an absolute pleasure! Such a lovely couple, it was so nice to get to know you both - we really hope to see you again before the end of the year, it would be the perfect end to our first Season! This lovely gite was just perfect for a romantic getaway in South West France. It was furnished and decorated to a very high standard with great views of the countryside and a pretty sunflower field. There is so much to go and see in this area of France it really is worth visiting. Our hosts Lisa and Darren were so welcoming and helpful, we are looking forward to staying again soon. Thank you so much Julie and Gary for your wonderful comments - we are so glad that you enjoyed your stay - you were the perfect guests, and we hope to see you back here again soon! Magnifique gîte, au cœur de la nature, je recommande vivement !! Merci beaucoup pour vos gentils commentaires. Je suis si heureux que vous avez apprécié votre séjour - et nous espérons que vous reviendrez bientôt. We really enjoyed our week at this gite. Lisa and Darren gave us a very warm welcome and were on hand to give advice about the area - what to visit, where to eat etc. The gite itself is 'a labour of love' - it is renovated to a really high standard and decorated tastefully with lots of 'special touches'. It had everything we needed! It was so relaxing to sit out on our private terrace and look out over the fields and the sunflowers. The plunge pool was a lovely way to cool off in the heat! 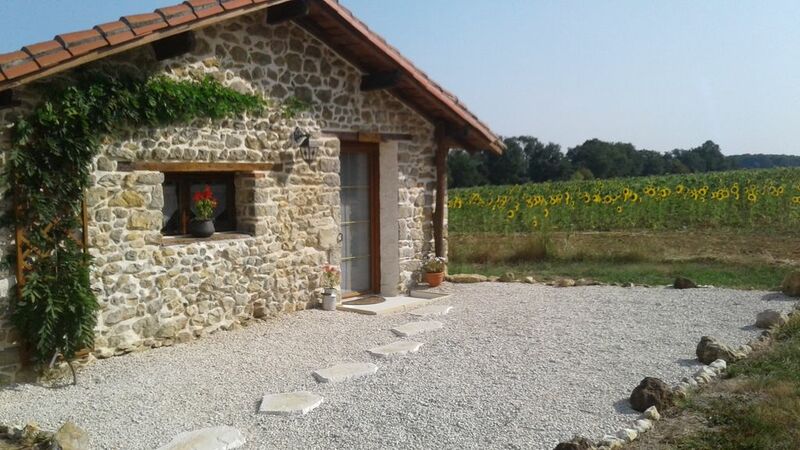 We would recommend this gite to any couple looking for a relaxing retreat in the French countryside. Thank you to Lisa and Darren for helping to make our stay so enjoyable. It was our pleasure Nigel and Jenny - we enjoyed your company very much, and would be delighted to see you both again. Ce sont des gens merveilleux , très discrets tout en étant très attentifs à nos moindres désirs.Le logement est conforme à la présentation avec une décoration très raffinée.La salle de bain est d'un grand luxe avec beaucoup de jets massant (baignoire et douche). A l'extérieur la piscine est vraiment privée , dans un décor très champêtre. La région est très intéressante pour des randonnées vélo , du canoé et la visite de sites culturels. A recommander aux amoureux , aux amoureux de la nature et de la quiétude . Merci beaucoup Claudine et Alain pour votre merveilleux commentaire. Vous êtes des gens si charmants, c'était un plaisir de vous rencontrer. Des invités parfaits!! Nous espérons vous revoir bientôt.